Christmas cheer: The Good Shepherd Primary School choir at Mater Private Hospital Springfield. SWEET singing primary schoolers have brought Christmas cheer to Mater Private Hospital Springfield. “The nurse who made my bed this morning came to get me when the choir arrived on the ward. She knew I was looking forward to hearing them sing and made sure I didn’t miss them,” she said. Mrs Chapman is looking forward to going home and celebrating the Christmas season with five generations of her family, including two great-great grandchildren. Teacher Kathryn Allan led the choir and said it was a great opportunity for the young students. Assistant principal religious education James Bradley said the occasion highlighted the importance of community outreach while celebrating the story of the birth of Jesus Christ. “It truly encapsulates the spirit of Christmas giving to others and the sense of the season and the joy it can bring,” Mr Bradley said. Mater Private Hospital Springfield director of clinical services Suzanne Hawksley said the choir showcased the Greater Springfield community spirit. 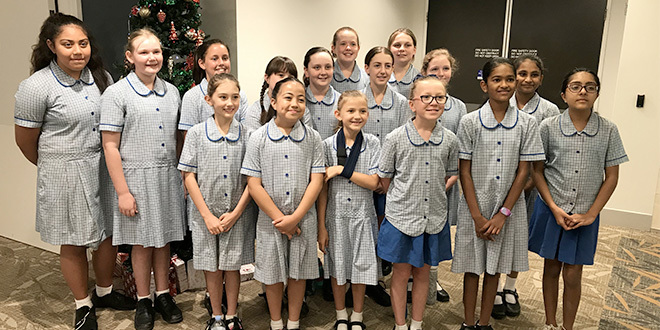 “It can be hard for patients having to spend time in hospital as it gets closer to Christmas, so we appreciate the efforts of the local school for sharing their beautiful voices and bringing Christmas cheer to our staff and patients,” she said.